© and (p) 2010 Z-BOP. All tracks written and produced by David Kempston for DJK productions. After eons drifting through the void, Clatterbox emerges from cryo-sleep activated by an emergency coded transmission. Encrypted distress beacon data has now been de-coded for human translation. Dave Clarke, White Noise Show, 05/06/10. "Great EP! Force Field, Sentinel & Argonaut are my favs, will be playing them in my set. Definitely getting peak time action at the Autechre show I'm playing in June. Mad respect! Great job as always!!" "Really digging 'Sentinel'. Good energy and lotsa funk! 'Synthetic Lifeform' has some really interesting synthesis elements going on. Almost some 'synth pop' elements to the sound palate and it makes you wonder which way the song might go at first. Overall, nice balance to this EP. VERY STRONG RELEASE!!" Dylan Gadwa (Open Concept Recordings). 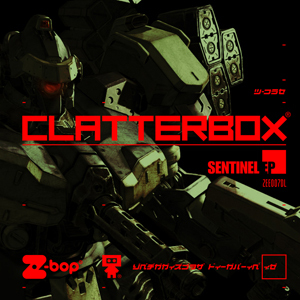 "Clatterbox has been out of the game for a bit but returns on his Z-bop label with four tracks of harder-edged electro. It's a case of if it ain't broke, don't f*ck wit it for 'Sentinel', sticking to his lasers with precise, streamlined and robust electro-jacker rhythms, while 'Synthetic Lifeform' adds fluttering Teutonic melodies and 'Argonaut' goes dark and dystopian, just how we like it. Ace!" "Absolutely crushed and sinister electro from Clatterbox on his label, Z-Bop. Title track, 'Sentinel', is set to blow speakers up with its electrifying arpeggios, photon laser FX, and smashed analogue percussion. 'Force Field' lays down a drifting, hypnotizing melody over chest-caving kicks and snappy 808 snares." "Finally Z-Bop, label from the veteran David Kempston aka Clatterbox, is back. The new ep is from David himself and it is a bomb: the tangible example of the philosophy of the english label that spread electro in every forms since 2003, giving to the genre always new inputs. 'Force field' opens the game with a mixture of syncopated rhythms and raw synths. Follows the title track 'Sentinel', great drexcyan electro style piece with an acidic feel that Dave Clarke has charted immediately, 'Synthetic lifeform', delicate electro ballad with a kraftwerkian taste, and finally 'Argonaut', epic song that close the ep at the best. Great realease to get immediately." "From the new Sentinel EP, 'Force Field' is a brief track that combines retro and futuristic electronic sounds. Think as if a musician from 1985 was creating music that intentionally sounded futuristic. This electro record stays within a limited palette of artificial sounds to produce an intentionally-cold track. After all, the future – according to every sci-fi movie made since the mid-20th century – is always full of those uniformly dressed in a nearly monochromatic world." "Yowzah...into Electro? Check Clatterbox 'Sentinel' zee007DL."